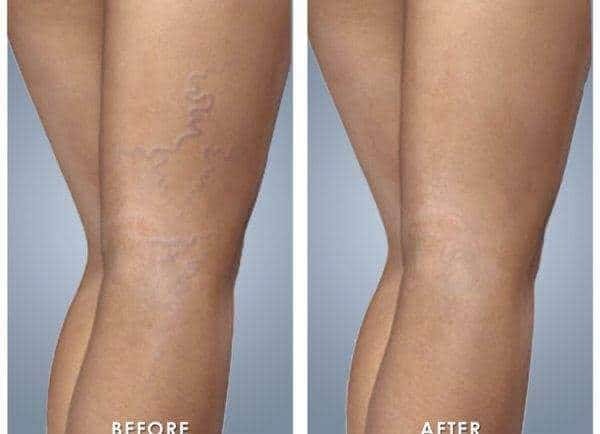 Here is an effective treatment to remove ugly unsightly red veins? Are your veins a cause for embarrassment? Do you have to hide your legs or other body parts? Well-read on, we can remove your red veins. We have had years of experience in laser, E-light and IPL treatments. We offer both IPL, E-light and laser red vein removal treatments. Both are effective, vein removal treatments with good results. Each treatment is painless and safe. IPL and E-light is a milder treatment which may require more treatments to get the result you are after. YAG laser is a more powerful laser that works deeper under the skin. The YAG laser maybe the better treatment if IPL is not getting the result you are after. One of the benefits of YAG lasers is they can treat people with darker skin types. We can adjust the power for IPL, E-light and laser up or down, if any discomfort it felt. Rather than us trying to help you decide what treatment is best for you on the internet. Just make a booking for a free consultation. Let an expert look at the problem and advise you what treatment option is best for you. You are in good hands we remove red veins on a daily basis. Why not get another treatment while you are here? We save you time and money with our latest 980 laser, in most cases just one treatment is required. Yes, that's right, we save your time by not having to come back three or four times. That also saves you money, a cheaper more effective treatment for you. Talk to us today about starting your best safe effective red vein removal treatment today. For an all over whole body experience come and see us in Lane Cove on the North Shore. Come and relax in our opulent ambiance, welcoming staff, the scent of essential oils, calming music, the soft cool breeze. For world class, exclusive treatments and products, we are the beauty and skin care experts in Lane Cove on the North Shore.